Back to business travel was the motto of the day, after a six week stretch at home. Took an early morning flight from Nuremberg via Frankfurt to Cairo. I had hoped so much to see the pyramids during approach into Cairo airport, but sat on the wrong side of the plane. Instead I was treated to great views of the city and the Nile. I’ll be on the ground less than 24 hours. So I’m in on the most iconic cities on the planet but sightseeing is limited to aerial views from the plane and taking in street life from the windows of our shuttle bus during transfers between airport, hotel and restaurant. 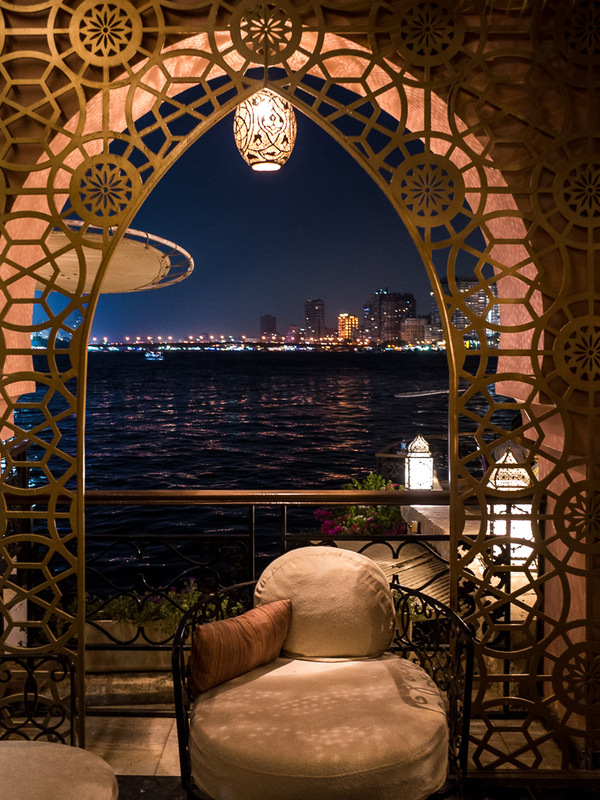 Talking about restaurant, the absolute highlight was meeting my new Egyptian colleagues and enjoying together a splendid dinner in the Kebabgy Grill on the tip of Gezira Island. It was really special, not only the great talks with incredibly hospital people, but also the atmosphere while we were sitting directly at the Nile. The table was set with all kinds of delicious foods and we were waiting for the Muezzins to call out sunset, as it’s the holy month of Ramadan and everyone is fasting from sunrise to sunset. Security is obviously an issue in this metropolis of 21 million, police and security forces are visible everywhere and also the fact you need to pass a machine gun post to get into a restaurant is a bit eery. Anyway, a half day of intense meetings ahead, then it’s off to Budapest via Vienna, where I will arrive close to midnight if all goes well. The photo of the Nile from the restaurant I took with the Ricoh GR, image specs were 1/6 sec at f/2,8 and ISO1600. For a city like Cairo the Ricoh is the travel cam of choice as image quality is awesome and it is small enough to fit my front pocket. Only a pitty there wasn’t more opportunity to use it. Thanks for sharing this post. They are such a amazing & great information . Definitely worth the read! Thanks! Hi. I like your page. Thanks for sharing such useful content. Hello, everyone, hope you’re having a great day. I’m running a blog about travel and personal life experiences, I would really appreciate it if you checked it out. Thanks, Clare, your kind words mean a lot! I do love your photo! I had an amazing chance to visit fully Egypt, before 2010, that time I didn’t know that it could be last chance to fully enjoy the place. Thank you so much for commenting 😊🙏! Hey, I’d like to echo Dubai Pinot Explorers- that is a seriously classy and cool shot! Thanks for the post, looking forward to hearing about Budapest! Thank you so much for commenting! And yes I feel privileged to have a job where I can travel the world. Nice post! I’ve made a post about battery life so if you have time and will please go and check it out! If you like it pls follow me, I follow you. I can only deeply recommend the Ricoh, this is an awesome machine (my today’s post is also all Ricoh). Go ahead and use the pic. We didn’t ry to get real drinks as it was Ramadan and we were there with local colleagues. Thanks for visiting and commenting! Danke. Du solltest auf der rechten Seite sitzen! Beim Rückflug lag ich wieder falsch, aber nur ganz knapp 😉 ! Dafür haben die Inseln in der Ägäis entschädigt 🙂 ! Liebe Grüße zurück! What a beautiful setting for a dinner! I would find the security intimidating. Paris was my first experience with increased machine gun presence. But I haven’t traveled to nearly as many locations as you have. Enjoy your time in Egypt, Marcus. I was in Egypt 7 years ago. And that was fabulous. I do hope I can return someday. Looking forward your photos.. cheers.. I hope to visit Egypt one day. It’s interesting to hear the small details about security, etc. Too bad you don’t have more time to explore, but you’ll probably get to go back! Cairo! Years ago I wanted to go there as part of a business trip but was put off by security issues. Your photo’s re-ignited my interest … but I think I still have to postpone it for now. Great ambiance photo! I’d love to be able to travel like you but I imagine doing it for work vs. pleasure isn’t nearly as glamorous but still … 🙂 Have a wonderful week Marcus! Yes, I sure would rather be traveling for fun!!! ein Traumfoto von einem Traumplatz.Meinen Glückwunsch.Danke vielmals für das Zeigen.Ich wünsche das Allerbeste.Liebe Grüsse. Well, pity that you didn’t get to see enough of this amazing country. I once visited almost the day the first protests broke out and thought I’d share one of my post. Have a good week too. So what I missed I saw in your beautiful photos 👏👏. Thanks for pointing out your post. I will be back for sure one day.